Edvard Munch's famous paintings, "The Scream" and "Madonna," were stolen from the Munch Museum in Oslo on Sunday, August 22, in a bold heist as tourists looked on. The February issue of Sky & Telescope reports that Edvard Munch's blood-red sky in his most famed work was produced, not by his imagination, but by detritus from the eruption of the Indonesian volcano Krakatoa. Krakatoa had erupted on August 27, 1883, the haze had just reached Norway, causing the most luridly colorful sunsets seen in generations. 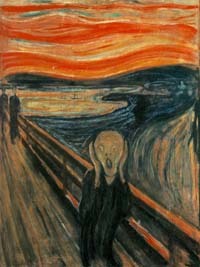 "Astronomical Sleuths Link Krakatoa to Edvard Munch's Painting The Scream"